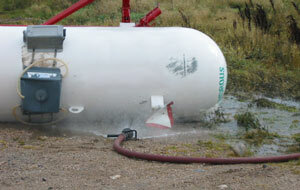 Ammonia vapor and liquid needs to be disposed of properly as well as ammonia contaminated water and soil. Events will occur when the release of anhydrous ammonia will need to be controlled. For example, to reduce nurse tank pressure ammonia vapor can be bled into a container of water. But this creates a water disposal problem. Soil will become contaminated from water applied to an ammonia vapor cloud. This creates a soil disposal problem. Ammonia contaminated water and soil may need to be collected to prevent adverse effects to the environment. Below is a list of several disposal options and precautions. Ammonia must be added slowly to prevent a violent reaction. A sufficient amount of water must be available. Plan on adding no more than 20 gallons of ammonia per 100 gallons of water. This will result in a 10% ammonia solution with a nitrogen concentration of 8.2% by weight. If the water supply becomes saturated with ammonia it can no longer absorb any more added ammonia. Adding more ammonia will simply boil away creating an exposure hazard. This will likely occur at an ammonia solution concentration of 16% (i.e. 30 gallons of ammonia in 100 gallons of water). Only someone trained and experienced in handling ammonia should attempt bleeding ammonia into water. The subsequent aqua ammonia can then be used by the fertilizer dealer as a nitrogen fertilizer provided that nitrogen credits are first predetermined, used as herbicide makeup water or other appropriate ways. Aqua ammonia can also be produced when the fire department applies water to knock down an ammonia vapor cloud. Pools of aqua ammonia may need to be pumped and disposed of properly. Because of the toxicity of ammonia to aquatic organisms, NEVER dispose of or allow any ammonia or ammonia contaminated water to flow into any surface water bodies. Surface water bodies include drainage ditches, storm water and sanitary sewers, wetlands, ponds, lakes and streams. See Ecological Effects. Soil contaminated with ammonia or aqua ammonia may need to be excavated and properly disposed of according to local and state regulations. Often times the soil can be land spread as a nitrogen fertilizer credit. Soil contaminated from ammonia may be allowed to remain provided that soil samples are taken and concentrations are below soil cleanup goals as specified by the MDA. Land filling is an option for contaminated soil and water but should only be used as the last resort and only upon preapproval by local and state regulators. Land spreading is the preferred method of disposal because ammonia is used for its intended purpose as a fertilizer. Small puddles of ammonia can be left to vaporize provided people, animals and valued plants or trees downwind are not exposed. Never apply water to a large pool of ammonia because the reaction will be violent and the water will warm the ammonia creating more toxic vapors. Large pools of ammonia must be addressed by only highly trained and experienced professionals who recognize the hazards and can take all appropriate safety and remedial actions. Minnesota Statutes 18D.1052 requires that the MDA preapprove the land application of fertilizer contaminated soil or other media. Therefore, the MDA must be involved and oversee soil excavation and land spreading. The MDA may also need to evaluate and approve the use and or disposal of ammonia contaminated water.